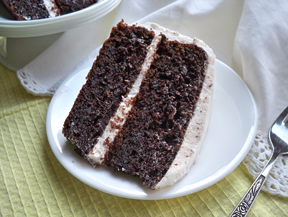 Moist and delicious, this cake can be frosted with your favorite frosting or simply dusted with powdered sugar. Its rich flavor will have you coming back for seconds. 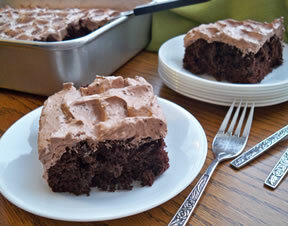 This quick and easy chocolate cake recipe is one you will surely want to add to your recipe box. Grease sides and bottom of two 8 or 9 inch round cake pans or a 9 x 13 cake pan. Preheat oven to 350 degrees F.
Use a fork to mix; batter is thicker and moister if you do not use an electric mixer. 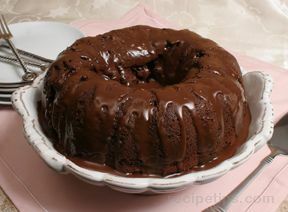 Pour batter into two round cake pans or a 9 x 13 pan. Bake for 30 minutes. Check doneness by poking a toothpick in the middle of the cake. If it comes out clean the cake is done. Do not over bake. 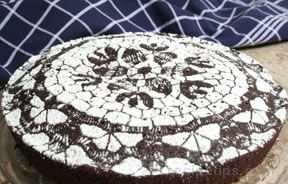 Allow the cake to completely cool and then frost or dust as desired. Note: This cake recipe does not contain any eggs.